Bring calmness and beauty to your property with a water feature installed by Rick's Landscaping. Enjoy the full delight of a waterfall and pond with its sights and sounds. Many sizes are available with a unlimited range of designs. We work with clients to develop a plan unique to the property. 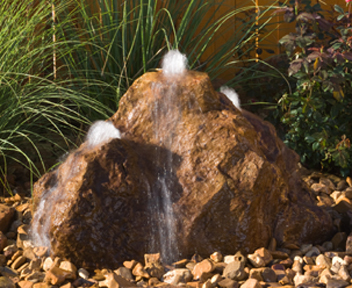 Pondless waterfalls give you the freedom to enjoy the water without a visible reservoir of water. The water stream flows into an underground reservoir and recirculates invisibly. It is a great alternative to a pond for those concerned about size, zoning restrictions, maintenance, insects, animals, small children, or other safety issues. Pondless waterfalls can be designed to fit your existing space. They can have a very small footprint in a vertical space or can have a stream of any length. For an even more space saving design you can install a natural rock fountain or "bubbler". The sound of the water cascading can be adjusted for different effects based on the water volume and the position of the rocks.